In a previous article, I outlined the procedure for taking apart your NES console and refurbishing the 72-pin connector. As I had mentioned, the connector is only half of the problem. Over time, the contacts on cartridge games become dirty and oxidized, preventing proper contact with the console. Many games bought on the used market are disgustingly dirty and while other systems don’t have the problems associated with the 72-pin connector on the NES, cartridges should always be cleaned before you play them for the first time. Games for any system can have problems playing if their contacts are dirty enough, and over time enough dirty cartridges inserted into a system can cause it to have problems and need a thorough cleaning as well. By getting into the habit of taking just a few minutes to clean games brought home from hunting trips or purchased online, you can avoid these issues entirely. The generally accepted way to clean a cartridge is to use a cotton swab and isopropyl alcohol, rubbing the contacts with a stream of Q-Tips until the cotton no longer comes out looking dirty. Some will even tell you to get the most concentrated (lowest water content) alcohol available, as the extra water will promote oxidation or even corrosion. In fact this is really not the case, as the alcohol/water mixture will evaporate much too quickly regardless of the concentration, assuming that you use a dry Q-Tip to soak up any excess fluid as a final step. The real problem with this method is that it simply isn’t always an effective or efficient means of cleaning a game’s contacts. I used to use this method all the time, and in general it worked fairly well although sometimes the fix was temporary (meaning that the game would start acting up again a short time later.) Additionally, it would sometimes take a small handful of Q-Tips to get the game clean enough so that the cotton would cease to look dirty after running it across the contacts. A bit driver, security bit, and Staedtler white plastic eraser. The eraser can be bought at any office supply/stationary or art store (or Amazon) and costs about $1.00. 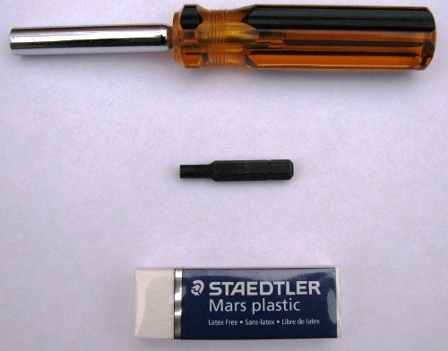 I buy the “Staedtler” brand because they sell a high quality product that is produced in Germany instead of China. White plastic erasers work well in this capacity for the same reason that they work so well for their intended purpose; they don’t leave a residue. The pink rubber erasers leave a residue (which is why they leave a pink smear on paper) and are not soft enough for this application. Security bits can be bought as a set on Amazon. This set will open just about any game cartridge out there (it says it’s for Nintendo, but the 4.5mm driver opens Genesis carts.) The two screwdrivers should be household items but can be purchased cheaply at any hardware store if needed. With these 4 tools, it is possible to open up almost every game cartridge ever made. An unfortunate exception are most cartridges from the Atari 2600 era, when screws used to hold the cases together were generally placed underneath the label. For those games, I have found the cartridge cleaner from the NES Cleaning Kit to be an effective alternative. The process itself is quite simple. After opening the cartridge shell, simply lift out the PCB. You will need to put a lot of pressure on the contacts with the eraser as you clean them, so make sure that the PCB is properly supported so that you don’t accidentally break the board or anything that’s soldered into it. A great way to do it is to lay the PCB down on a mouse pad, but I just hold it in my left hand with the length of my index finger up against the opposite side of the contacts. To clean the contacts, you simply rub the eraser over them as you would on a piece of paper, only harder. The plastic eraser is soft enough that it can’t damage your game, so there is no need to be gentle. After cleaning a few games, you’ll get a feel for how much pressure you need to apply. Too little and the game won’t get clean, but you certainly don’t need to press down as hard as you can. Be careful when cleaning the contacts on the backside of the board, because the solder can be sharp enough to leave you with a nasty cut if you accidentally run your fingertip over the solder points. A typical Super Nintendo game PCB. The contacts on the left are dirty from years of use. The contacts on the right have been cleaned with nothing more than an eraser, and look like new. It should take no more than a few seconds for the contacts to become clean. The picture above shows a Super Nintendo game that I had just purchased at a local used game store. Upon opening it, I found the usual amount of filth that would accumulate on a cartridge of its age, as can be seen on the left. I used the eraser for only a few seconds on the right side, and the contacts literally look brand new again. Although the contacts on this game were dirty but not oxidized, the eraser method will remove light oxidation as well. If the contacts are actually corroded (rusted) then this method will not work and more drastic measures must be employed. In this situation you have little choice but to use polishing cloth or super high-grit sandpaper, which unfortunately will also remove the gold plating, and should therefore be used sparingly and only on the corroded portion itself. This level of damage on a cartridge is rarely seen, however. As a bit of a neat freak when it comes to my collection, I love this method for its ability to make my games look brand new, at least from the inside. I also love it because it keeps my systems clean and gets the game to run the first time, every time. Considering how much a large box of name-brand Q-Tips cost (the store brand ones are useless), the $15 or so that it takes to get the security bits, driver, and eraser needed to clean your games this way should be a no-brainer. Once you start, you’ll probably never reach for a cotton swab again. Tagged cleaning nes games, how to clean game cartridges, how to clean nes games, how to clean video games, how to fix blinking nes. Bookmark the permalink.